But, they argued, climate was on a new trajectory so our method would not work into the future! It sure is. It’s called a political trajectory. And all this politicking leads to mission drift. Evidently, the BOM is currently unsure around the distinction made between weather and climate. Congratulations on your successful and productive collaboration Jo. That raises some interesting questions, Manfred. Does the BOM see “the climate” as being the sum total of past and present “weather”? Or does the BOM see “weather” as having to be consistent with what the climate models predict? I suspect the latter, and if I am right, then that would be clear evidence of past and present political interference. That would also explain their reluctance to release the data, to people who actually paid for it, through their taxes. RW, I’d vouch they’d prefer a perception of concordance between the vagaries of daily weather and the de rigeur, politicised climate catastrophism. Their bias betrays them and we at least, recognise that here. Your second point is the one that raised my hackles. As civil servants, they work to the pleasure of the tax payer and their elected representatives. Sometime ago, someone put that collective cart in front of the horse. Few appear to have noticed the oddity. Water in evaporation is fresh water and NEVER has been included any loss to space…even though we have massive salt deposits and crystallization structures of rock suggesting massive amounts of pressure. Exhaust from the sun too is NEVER included which generates pressure of our orb shape. We have a planetary imbalance due to water loss creating this wobble as the planet is being squeezed back into an orb shape as it is rotating at incredible velocities. The exhaust being Nitrogen has very unique properties that are extremely fascinating. Absolutely right, you must be a CSIRO employee. Only someone like that could have the incredible insight to realise nitrogen exhaust as being the root cause of all our problems. Likewise, the orb shape of our planet is a factor that is routinely overlooked. Clearly, this is something which needs to be included in the BOM Climate forecasts to bring their methodology up to Professors Jones and Mann’s high standards. You are right to point out the importance of rock crystallisation structures, as this shows how important pressure can be in the formation of………………..
Oh rats! I am babbling crass BS, just like a typical climate scientist, but it feels so gooood! The Wivenhoe dam was illegally full. I read that it reached 192% and this was very puzzling for any dam. 100% is usually enough. The extra 100% is for safety only but thanks to Green extremists, it had long passed the point where by State legislation the sluice gates had to be opened and the level lowered. There was an investigation but no one was punished for what could have been the worst civil disaster in Australian history. Blame was passed around but it was ultimately ignorant Green politics translated into lack of responsible and requisite action by the dam engineers. The engineering problem is that the huge Wivenhoe dam which held back two Sydney harbours was built on the cheap for flood mitigation. It was an earthworks dam which is why the legislation existed. If the water overflowed the dam, which could have happened in a single night, the entire dam would have been washed away and the Brisbane river valley suddenly filled by a wall of water, drowning untold numbers. So the smaller flood which was now absolutely necessary inundated the very areas which were supposed to be made safe by the dam and opened for housing. This was nothing compared to what could have happened if there was a heavy downpour that night. Brisbane would have vanished. It is an example of how Green extremism put a million lives in mortal danger and how irresponsible experts could say even the rains which fell would not fill the dams. At 192%, the Wivenhoe was a man made disaster waiting to happen. There was no part of this flood and potential disaster which was due to the weather. It would have dwarfed the other worst Australian civilian disaster, the 1200 innocent lives lost to Green boat policies in the Timor sea with a million Australian lives sacrificed to Global Warming. And so it is, as we have witnessed, with bush fire risk ‘management’. Also the Greens. By not acting earlier, forest floor fuel loads build to the point where the fire is so hot, the trees are killed not scorched. The worst fire was in Canberra itself simply because the council was not allowed to clear to prevent fires. You have to feel sorry for the two farmers each fined $150K for clearing around their homes which became the only refuges for local residents when the fire came. Green councils this time. The huge fine money was not returned as far as I know. Greens appear to operate in a world of wishful thinking except for Green politicians who are dedicated communists like Adam Bandt, Lee Rhiannon. Just how much damage, destruction, loss of human life and death of countless stock and wildlife has happened due to green politics? Perhaps the worst example was in Victoria in 1997 when 190 people lost their lives. But it still continues by not managing National Parks and other land properly; lock the gate management doesn’t work combined with the inability to be able to do enough hazard reduction burning under benign conditions to reduce fuel loads. The problem with common sense is that is not all that common, particularly with green politics. If these”Greenies”were held to account for their “Stupidity”they wouldn’t be around for long. I thought it was 2009 when 173 lost their lives and Marysville and other places were burnt out? You are correct Anne, 2007 not 1997. I had a look at one of the greens political web sites one day – it seems “green” is a bit of a misnomer – the general gist I got was that the party did have some green bits in its policies, but was more of a political “sump” – in as much as all the pretty awful on-the-nose stuff as a society we’d rather do without , had all drained down and collected together in one spot….. I think this is worth noting – when you deal with greens, tree hugging just pure camoflage – they are more trojan horses for stuff I’d rather not even talk about…. No, Wivenhoe was built as a flood mitigation dam. It can hold up to 3 times its normal operating level. It was nowhere near being a problem. .. and the fact that the operators should probably have started letting water out a couple of days earlier. The theoretical maximum was 225% not 300%. Or put another way the design was drinking water 1, flood mitigation 1.25 but later reduced to 1.0. The scary unknown is a very heavy rainfall where the rate of inflow exceeds the rate of discharge leading to a potentially catastrophic situation. Any discretion vanishes at 200%. Fuse plugs were placed at 75.7 metres, which would theoretically wash out and protect the wall. These may not be enough and a single heavy rainfall can overwhelm this and it was a real possibility. So the operators were forced to open all the floodgates, eliminating its function as a flood control barrier and making it the reason for the flood. The inquiry was into why this could not be foreseen any why engineers were so slow to act to dump water earlier and who was responsible for what was clearly a wrong decision to go to 192%. What was the result of the dam inquiry? Did any heads roll due to holding back so much water in the wet season? I cannot recall. I could not find the result, but it was more a Yes Minister inquiry, designed to frustrate and delay and bring in a complex report about ‘the science’ and how much research is needed and how they have passed it to the CSIRO and some consultants to bring in another report to prevent something like this happening again. More computer modelling as well and study of climate change affecting rainfall patterns. So expect a whitewash with a few people taking early retirement. You can be sure no Green politicians were harmed in the making of this report. Also an obvious problem with flood mitigation is that if you seriously belief much more rain is coming, you do not store. If you believe we are still in a drought, you do not release. The longer this goes on the worse the problem when you do. It is this overwhelming belief in a drought, a religious belief that the rains would never fill the dams, that must be behind what in hindsight was an unbelievably dangerous decision to keep filling even in the rainy season. When you get Australian of the Year, really dead kangaroo graduate posing as a science expert in meteorology and hydrology claiming that “even the rains which come will not fill the dams”, what can you expect? Such people should refrain from offering advice on things they know nothing about. At least Adam Goodes could play football. If you let the storage drop to say 50%, and the rain falls on the other side of the slopes..
You are going to look very very stupid !! And that’s the problem.. always playing off possibilities against possibilities. No-one knows enough about “forecasting” to be certain about anything. Consider the dam was 100% full, not 50%. Job done. Full at the start of the rainy season! The extra 125% was a buffer against exactly what happened and thanks to an insane attempt to save this extra water needlessly the flood mitigation did not work at all, creating exactly the sort of flood the dam was built to prevent. Look stupid? This was criminal. The lives of perhaps a million people were put at real risk for nothing. It was a very near disaster on a scale which is unbelievable. Poor management hardly covers it. My continuing point is that the prevailing Global Warming view of the never ending drought was responsible for sensible educated and reasonable people making such bad decisions. The drought was over. Stupid is a hopelessly inadequate word for what happened. The flood mitigation DID work. The flow down the river below the dam was a fraction of what it would have been without the effect of the dam. Given time, I can talk to one of the guys who actually did part of the enquiry. you may even have seen this before, as I think I have referred to it here at Joanne’s site previously, but for some who may not have seen it, it’s worth revisiting it. In the days immediately following that huge flood event of Janaury 2011, I put together a Series of three Posts at my home site detailing what was happening with Wivenhoe. I tried to make it as detailed as possible, but what I wanted to do was to take some screen captures of the dam levels across that period of time for both Wivenhoe, and also Somerset, which is directly upstream from Wivenhoe, and flows into Wivenhoe. I’ll link you into the main Post of the Series, but there are links to the other two Parts at that main Post, and those other two provide some background. That main Post is by necessity very long, but is well worth reading. It probably seems like I’m drumming up visitors to my Posts, but this is general interest, and probably not something that was done in any great detail. Thanks. Not sure of your comment about the damage being larger because Brisbane was simply bigger. Friends wanted to buy in Brisbane and refused to buy land which had been submerged in the 74 flood. This was shown on the map. So there was a lot of land sold for housing which would not have been sold without Wivenhoe for protection. Nobody considered the scenario where Wivenhoe was forced to dump, recreating the 74 flood. It should not have happened. Anyone can equivocate but my simple proposition is that the Green bias was for storage even in the rainy season because self appointed experts at the time were saying any rain was just good luck and would not come again. They were wrong. This in turn caused a serious misjudgement of the value of long term storage against flood mitigation, half the original purpose of the dam. Flood mitigation did not happen as it should. Consider the 100% drinking water half was full prior to the rainy season. That’s all anyone wants. The top half should just be a buffer with an ideal level of 0%, not 92%. Running to 192% is not justifiable unless you are certain the rain will not come and who said that? Once headed down this path, the choices became harder and harder and praying to luck and agonizing and arguing it is complex is not the same as making the right decision earlier, so they waited to the very last minute when there was no choice. The flood buffer was utterly gone. Sure this was the right decision politically in that anyone would have opened the sluice gates facing certain disaster, but that puts lives at risk, as happened and it could have been a lot worse if the rain had come that night. I too watched the radar. It was a narrow escape from total disaster and why? The flood mitigation component should never have been allowed to go to 92% under any circumstances and especially at that time. That was not flood mitigation. That was wrong, courted unimaginable disaster and reproduced the 74 flood anyway, defeating the entire purpose of the dam and drowning people and houses which relied on prudent management, not panic. We had a similar but less dangerous situation with the Victorian North South pipeline, an $800million pipe rammed through private properties and not used, except in the middle of the Goulburn flood at the end of the drought when it dumped water into the flooded river in a huge rain storm because in the words of the engineer, “the water was booked six months ago”. That is not complex engineering. It is culpable. TdeF, they were NOT running at 192%.. that is what it filled to when it was doing the thing it was designed to do…. mitigate floods. All that was between control and utter disaster was a short distance. It should never have come to this. What is questionable is that in a torrential downpour, even with the emergency spillway in full operation, whether a further increase in the water level was avoidable to avoid collapse of the dam. Earthworks dams like this have collapsed in China. Of course everyone can argue later that they all behaved responsibly and that it was no one’s fault. It was all unavoidable. Was it? Justifying doing nothing is the response of the conflicted bureaucrat. The conflict comes from the story that the rains will not come. That was never science, just Green politics. Wiki vs SEQ .. hmmmm. ! I get this gnawing feeling, that within green circles there may have been a hope the dam *would* fail ( hence the delay in approval to release ) and thus push a lot of population out of brisbane once flooded, and continue the demented green Gaia mytholgy….. It has a similar ring to it regards horrific fires around canberra in 2003 that conveniently were not fought for 4 days……mind you, a lot of land was then available for housing afterward…coincidence? I understand that this is not specifically the topic of Jennifer’s Post here, but this is also of interest. In that whole long Post of mine’s text, there are two crucial things that might get lost in the vast body of text. 1. What happened on that first weekend. 2. The dollar value of the water behind Wivenhoe prior to the event. Addressing Point 1, There had been some rain in the lead up to the major dump, which began slowly on the Saturday, building up to the Monday and just got worse from then on. On the Friday, Somerset was at 107.2% and Wivenhoe at 106.3%. Roll on the weekend, as the rain and the levels built up. The dam’s engineers could see the levels dramatically rising, but ANY decision to open the gates and release water could only be made by people way way above those engineer’s pay grades, no matter how drastic they made the situation out to be. Further up the decision making line, it would probably even had to go to Government Minister level to actually approve the opening of the gates, considering the damage that might be done downstream, considering that there was already signs of minor flooding. Those engineers were probably pleading to open the gates, but it was the weekend. See the point. On Monday morning the levels were, Somerset at 154.7%, and Wivenhoe at 148.4%. Panic stations would have set in and that decision was now made. The engineers would have said to please open them to full, and the Government Minister who would have to approve it was panicking that he might get the blame for what now HAD TO BE a major release. Late Monday afternoon the gates were open, and release level set at 645,000 MegaLitres per day, and still both dams were filling faster than they could release as the major rain dump just got even worse. Even releasing the water at that rate, levels on Tuesday morning were Somerset at 160.8%, and Wivenhoe at 175.9%. The release rate was still 645,000ML/Day, and water was backing up still faster than they were releasing it because on Wednesday morning the levels were Somerset 198.7% and Wivenhoe 188.5%. Levels started to drop, ever so slowly over the next days, when the release rate was also slowed. However, it ALL stems back to the Friday Saturday and Sunday, because the release was not approved until Monday ….. afternoon. Had release started earlier, perhaps even Friday, it may have been easier to control, instead of almost getting to the point where it became so drastic. Later on, it was recommended that the Manuals dictating procedures should be changed, but my guess is that the release decision was way up the reporting chain, all of them gone for the weekend, if you see my point here. Addressing Point 2, the dollar value of the water behind Wivenhoe. Consider that all of it gets sold to consumers, changed by the State Government at that time, three times in fact, increasing the cost, in fact more than tripling it in fact, to now levy a cost on ALL water, not just the earlier cost only on excess water, so now, all of that water becomes a dollar resource for the Government, so flushing it down the Brisbane River to keep levels low ….. in case there might be a big dump of rain is a loss of prospective revenue to the State. Wivenhoe at 100% was, at that time, a dollar value of $2.6 Billion. Perhaps now it becomes a little easier to see why the State would like that Wivenhoe level to stay at 100%. In this case, it came back to bite them on the @rse. We will never find out what happened on that Friday afternoon through to Monday morning. The relevant figures up the chain will cover their own backsides at the expense of the engineers and the rewriting of the Manual for procedure, also blamed on the engineers. You can bet that the engineers were screaming while the politicians went off home for the weekend. It must have been a terrifying weekend for all involved at the dam, waiting for a committee decision on Monday and the release level was obviously not enough. My point is that behind the thinking was the mad idea of keeping this windfall, oblivious to the real point of the dam which was flood mitigation, not storage. This reminds me of the failure of the British Government in WWII who knew their codes were also broken and so ships were being sunk for six months, but one bureaucrat in Whitehall did not want the expense of printing new code books. Clearly doing his bit to save money. 192% was nowhere near capacity, and the only way it could have been kept lower is if they had started releasing a few days BEFORE the storm, and as they had been very low in early 2007, I can understand their being a bit anxious about doing it. Wivenhoe Dam has conflicting purposes, so there will always be issues on how to cope with large storm events while maintaining storage. There should be another dam specifically for water storage. It was planned that way, y’know. Blame the politicians that didn’t do what the engineers said they should. in my Post I show the dam levels for both Somerset and Wivenhoe for Friday 7th Jan, and then Monday through Friday and then the following Monday. It took a while but I took screen copies for both dams for all seven/eight days, and converted them to images. I had an idea that in the washup, they might actually disappear, so I wanted to have some sort of record just in case. Even now, that site has been changed and now it is not as easy to see those images in the same detail they were during the event, with every detail of time date and percentage recorded. I remember looking at the Seq Water site in Jan 2011 to get the daily level readings. The data I downloaded had readings for Saturday mornings every week until 6 months prior to the flood. I thought it was strange they stopped measuring on Saturdays. Wiki vs SEQ data.. hmmmm ! I’m not sure if the Wiki comment was perhaps unintentionally aimed in my direction, (or not) but the figures I used in my Post were from the screen captures of what was the SEQ Water’s own website at that time, as I mentioned in the earlier comment, a website since significantly changed from what it looked like at that time. I mention in my Post that while the images are shown in small size for space requirements, if you click on any (and all) of the images, it will open up at the larger size in a new window, and as you can see from each image, all the details are there for each of those two dams in question, Wivenhoe and Somerset. I am just totally suspicious of anything Wiki says. I am hoping for more information about the final outcome of the enquiry. Tony, the Wiki comment was to show that I am not the only one who believes the dam was at least up to the spillway and the situation was dire. An engineering friend was responsible for part of the dam and made me aware of what few people know, that this was a very dangerous earthworks dam only faced with concrete and liable to collapse on an overflow. A torrential downpour that night was a really scary possibility and people were unaware. The dumping worked, the heavy rain did not come and we escaped with a major flood, the very flood it was built to prevent. The question was why? Was it simply mismanaged or was there a real problem with the concept which made the dam more a danger than an asset? The quick answer is in the prevailing attitudes at the time of harvesting water as we were in the middle of a drought, despite the fact that good rains had already arrived, as pointed out by cementafriend below. I am just against confusing the situation by discussing the balancing between three dams and modelling and computer simulations and engineering responsibilities and the chain of command when it is extremely clear. Despite the best efforts of good people to prevent this very situation, this was a near cataclysmic disaster beyond imagination because of the attitudes of the time, that the drought would never end. That is what comes from faux experts pushing their end of world scenarios, to the point of creating one. I doubt the people of Brisbane know how close they came. It was not the fault of the dam design. I wonder. As you say Tony, the engineers on the dam knew dumping was an hour to hour question but they waited three days to make a final decision to dump or not, while waiting on authority through the weekend to Monday but were the people in the path of the likely flood warned of this likelihood? How much property (like the car, for example) could have been saved easily if people had been given adequate notice of the likelihood of the man made flood? Was anyone in fact warned and how much notice were they given? Look at the image in this Post of Andrew Bolt’s and Posted at my home site, and I added an intro for the post. I had already done my own Series, which started during the event. I find it hard to believe that any of this was the fault of the engineers on site at the dam, as the decision to open those gates to full would have been one that could only be decided at almost Ministerial level, and this happened over the weekend. Tony, even you say the water was as close as 4″ to the top of the wall! Debating whose fault this would have been is missing the point entirely. It is not about whose decision it was to open the gates fully at the very last minute and who would have been at fault. It should never have been this close to unbelievable disaster. You knew it. Andrew Bolt knew it. I knew it. However everyone was waiting on a political decision? Why? This is James Bond stuff stopping the clock on the atom bomb, about six hiroshimas with a few hours to go! Did most of the people of Brisbane have any inkling their very lives were at risk? Do they even realise it now? The image you posted,”A Few More Inches and Heaven Help Brisbane” I still have as the wallpaper on one of my desktops. If I lived on the floodplanes below the dam I’d have been s*!ting bricks. Yes TdeF much of the flood was avoidable. Two things were not reported and not noted in the inquiry by a non-technical judge who is now Chief Justice of the Supreme Court Qld (she should not be as she breached the Professional Engineers Act Qld -none of the Commissioners were registered engineers and this is a criminal offense). 1/ It had been predicted by a number of people from looking at the SOI and PDO from September 2010 that the low rainfall period was over and that normal or more than normal rainfall would occur in the summer months of heavy rainfall 2/ December 2010 had a highest record rainfall since records available (at least back to 1892. For example a little north of Brisbane the average rainfall over 120 yrs (since 1893) is 173mm in Dec 2010 the actual record fall was 668mm. The average rain (since 1893) at that time in Jan was 233mm, in Feb was 263mm and March was 264mm- these averages would more than fill the dam on normal usage. Water should have been released from about 12th Dec 2010 when the average for the December month was exceeded. Tdef, with all due respect, the one thing people seem to forget is that we have hindsight. I was living on the south side of Brisbane at the time, and as an avid weather buff for a number of years (and with a civil engineering background, also involved with disaster management and recovery through my employment) I knew the potential of this system and was watching it intensely. Our property at the time had some inundation in 1974 from the Albert River (end of the backyard just went underwater) and while the lower level of our highset house was a good 2m above this point, I was watching closely because a repeat of 1974 levels in the Albert would have seen my shed be inundated. I have had many discussions on the topic on the Weatherzone forums, though I’m not sure if they’re still online or have been archived after all these years. The main area of rainfall was forecast to drift south from around the Sunshine Coast hinterland area (ie Somerset/Wivanhoe catchment), spread to the west towards Toowoomba etc and continue to drift slowly in a generally southerly direction over Monday / Tuesday (IIRC). What actually occurred was that the rain stalled all day Monday, and overnight into Tuesday, over the Somerset/Wivanhoe catchments, the dams themselves, and slightly below (plus a large cell towards Toowoomba causing that tragedy, I was on the Weatherzone forums realtime watching in horror with the others there, knowing the country and knowing what was coming down that range well before the authorities were able to react.) The rain intensified overnight Monday into the most intense rainfall rates in that area in recorded history (IIRC) and some of the most intense rainfall ever in the state’s recorded history (IIRC). I believe some stations even exceeded 1893 totals, which was a far larger flood in Brisbane than 1974 – it holds the record and I wouldn’t buy property in Brisbane which went under in 1893 even with Wivanhoe there now. In any case – I have always had the opinion, right from the hours as the event was taking place, that the dam engineers were (obviously) taking the forecasts into account and this is the true reason for holding back on the releases. If Monday morning’s forecast of the heaviest rain area moving south during the day while spreading west actually occurred, Wivanhoe would not have been in danger and the releases would not have been required at the rate they occurred. Plus, the main rain area would have moved downstream of the dam catchment – into the Lower Brisbane, Bremer and Lockyer catchments – where it could not be controlled by dams. So any earlier releases would have had the result of a large released pulse coming down the river potentially at the same time as the Bremer and Lockyer peaks, combined with the king tides and the epic rainfall rates over the city itself….that would have been an absolute catastrophe and mark my words, with all sympathy for those who had never been flooded before, Brisbane got off lightly in 2011 compared to the above unimaginable scenario. The CBD would likely have gone underwater. I was watching closely because the Albert River is south of the Brisbane. Luckily, in that catchment we avoided anything except I believe moderate flooding, mostly affecting rural properties. We had higher flooding in my area from other events in the last decade than 2011. But this was only because the heaviest rainfall stalled over the dam and upper section of the river for a good 24hrs beyond that forecast. The rain was forecast to be fully below the dam wall by Monday afternoon, so water was held to avoid the worst case scenario of all/most of the flood peaks combining downriver through the city. Instead it remained in place and intensified, so drastic action had to be taken. I fully support the actions taken by the dam engineers in the circumstances and I am distressed that they have become scapegoats for so many of the public. They did not have the benefit of hindsight which we now have, or even had on the Tuesday morning when it became apparent that the situation was urgent. The forecast was wrong. I don’t blame the meteorologists for that either, it was just a very delicate situation where regardless of what the engineers did, there would have been a flood and properties were going to be underwater. - And I nearly forgot, practice at that time was to keep low level bridges downstream from the dams open for as long as possible at the start of flood events to allow people in the reasonably substantial rural areas who would otherwise be cut off, to travel either back into or out of the area (as well as emergency vehicles etc). So I can fully understand the logic at the time. Slow to release after the above-average rains during recent months, a major event approaching and forecast to last a day or two, event occurs and actually lasts a full 24 hours beyond the forecast with unprecedented falls in parts of the catchment. Add political interference / decision-making to the above, and all things considered my opinion is that the engineers did exceptionally well, given the information they had at the time. If the forecast did come off and the rain moved south, they would have been lauded as heroes for avoiding a flood of ~1893 proportions. A fine line between heroes and devils – I’m immensely disappointed so many have been so quick to crucify them. Thanks. I am an outsider at no time threatened by this and understand that people who were directly threatened have a different view, clearly that everything that could be done was done. Are you sure? No crucifixion of engineers is envisaged and let us assume that at any given time, everyone did their best in changing circumstances. Even you mention the whole situation was prejudiced by years of low to no rainfall and the idea that good rains were unlikely, so the two errors were to be far too high at the start of the sequence of events and a delay in acting with adequate speed, which exacerbated a dangerous situation to crisis level. However the situation reached a level of danger which far exceeded the risk of previous floods, whether 1893 or later, the sudden collapse of the new (1975) earthworks dam, a danger which had never existed before. In allowing this to become a real and imminent threat, everyone involved is culpable given they knew the risk. Nothing was more important than protecting the dam and the fact that this became a real and present danger to the entire population of Brisbane at the time overwhelms all other factors. So why did it get to that point, a point which was clearly avoidable? How can it be prevented from happening again? Were the right criteria used to make a decision or was the desire to maximize water retention after a drought given priority without adequate recognition of the risk? Were people informed in a timely manner of the risk or did the engineers and bureaucrats just keep quiet to minimize panic and hopefully avoid personal blame and in doing so, did they fail in their duty of care? Really Brisbane dodged a disaster far, far worse than the flood which ultimately occurred. Frankly I believe few people even now recognize the terrible danger they were in. This potential remains. After every major bushfire in Victoria we have a Royal Commission. So far there have been 12 Royal Commissions into these regular disasters. Royal Commissions clearly fail to prevent tragedies from recurring. In this case there needs to be a directive that the dam is used for drinking water and the extra 125% is to be kept only for flood mitigation. The good Wikipedia article seems to cover this. During a flood the dam is designed to hold back 1.45 million megalitres of additional water for flood mitigation or 225% capacity. Under the water release plan which is defined by law, excess water must be released from the dam within seven days or a week of it reaching 100% capacity. Between April 2004 and September 2008, a 165-metre (541 ft) wide auxiliary spillway with a three-bay fuse plug was installed on the western portion of the dam to further mitigate flooding. In 2007, a feasibility study concluded that Wivenhoe Dam failed to satisfy the Australian National Committee on Large Dams (ANCOLD) guidelines on acceptable flood capacity. Why was this done? Clearly because the authorities who decided this did not trust the dam operators to act early enough, exactly as happened. It was this foresight alone which saved Brisbane. Hindsight saves no one. The very new emergency spillway was within inches of overflow. In essence it defined and forced the action which was taken belatedly and reluctantly. Otherwise with all the best intentions, bureaucratic inertia as mentioned by Tony could have caused the greatest tragedy in Australian history. Further, people have a right to know why for example the car was not moved in the days available and all that that implies. No one is saying the flood was totally avoidable, that the rains were not extreme, that individuals were not duly concerned, but that action was late and the public were clearly not adequately informed of the danger or in a timely manner and that if it was not for this emergency spillway, the danger was far beyond argument. We saw this in bushfires. In 2009 in Victoria we lost 173 lives and 2,000 houses. California that year also lost 2,000 houses but only 20 lives. The difference? The population is told to get out, not try and save their houses. We have now adopted that policy and learning from the Tsunami in Thailand where authorities knew for 2 1/2 hours was coming and did nothing, smss are used to warn people. I wrote about this, that Germans were off the beach because people in Germany warned them but not local authorities. So we need to learn from this. To warn people early, to force early action. To get our priorities right, lives before property, property before blame. To be honest about the risks and most of all, not to believe people who tell us the rain will not fill the dams, the greatest piece of dangerously wrong faux science I have heard in this whole Global Warming debacle. In 1987 I was in Hawaii passing through Oahu on holiday back to Australia with my young family when a Tsunami alert rocked the place. All the pacific transponders had ceased, indicating a tsunami over 400 metres high from the Aleutians, moving at the speed of sound. The authorities cut into every radio and television broadcast as a century before, Oahu had been wiped out. No panic, but people were running, air raid sirens were on, boats were seeking shelter at full speed and the freeways jammed. Helicopters over head were telling people to get out of their trapped cars and run up the nearest hill. Some Waikiki Surfrider Shearaton hotel staff voted to stay with the building. I rented the last car in town and drove my family to the top of the Diamond head volcano and watched the unfolding rapid evacuation below. I had forgotten fresh water. When the wave came in, it was 1cm high. Everyone just went home. A million people. We caught a plane. However no one in litigious America worried about blame, fault, cruxifications. Everything which needed to be done was done quickly without recriminations. Emergency services and a disaster plan were in action. It worked out. In Australia, we seem to hope it all goes away and no one is blamed for anything. We opened the flood gates at the very last minute and said nothing about what could have happened and the disaster we just avoided. This time it worked out thanks to the foresight of the people who built the new spillway in 2008. Just as well but the fear of blame seems to blind us to what we need to do urgently. As is obvious, I do not think everyone was adequately informed let alone adequately protected. I can say that in the last few years, our disaster planning is improving but the need for authorities to be honest and up front without fear of blame is still there. The fires this year in Lorne, Wye River and the Otways destroyed two hundred houses, but not a life was lost. We are learning from the Americans. Brisbane needs a disaster plan for floods. The loss of a C4 Corvette is bad enough without throwing incompetence into the mix, condolences to John. It saddens me that I was never able to afford a car like that, as a young man, nor was I able to feel the wind in my hair, on a sunny day. I am now able to afford an open-topped sports car, but if I bought one, I would just look like an aging, balding, poseur. I am at the Volvo stage of my automotive life, I am afraid. A Volvo! I’m so sorry Rereke there are support groups. Thank you. It is nice to know that people understand. Jokes aside one of the fastest cars I rode in was a Volvo Turbo 6cyl back in the 90′s driven by a local racing identity, you were pinned to the seat accelerating and it took corners at speeds not thought possible for a flying brick. As a motorcyclist the Volvo aware phase mentioned by Dennis was from old accident statistics that showed Volvos featuring highest in motorcycle crashes and being a then popular choice for older drivers the urban legend was born. Funny thing in my years of riding I never had a near miss with a Volvo, most motorcycles are potentially faster than cars and I believe riders generally should slow down to legal traffic speeds and reaction times, go to a track if you want to be Rossi. By the way, did your Volvo get over its nervous problem without you having to install a CD player? Motor cycle riders have been sighted with “Volvo Aware Rider” stickers on their machines. I had the opposite problem. I could have afforded a Honda S2000 when I was 30, but I convinced myself I just wasn’t into that kind of lifestyle. I didn’t drive for the sake of driving when I had cheap Ford, surely a flash car would only worry me wherever I parked it and would go to waste. And those things have no boot space either. No regrets about it though. Got a cheaper car, and a few years later the extra 26 grand was definitely spent better on non car things. It’s alright RW, you are not alone. We’ve driven Volvos for years; most useful with children and safer than most for distance driving. We did have an MGBGT for a while. Go ahead and buy the car you really wanted. Why should you care what other people think you look like. And actually aren’t you the one who thinks you would look silly or foolish? Doesn’t it just hold you back to worry about that? I say go for it. Life’s too short to settle for a Volvo. Believe me, if I could afford a bright red Ferrari I would have one no matter what anyone thinks of me for driving it. Why give up an opportunity for a good old fashioned mid life crisis. Who cares what anyone thinks? Buy whatever you wish, and drive it! There’s no such thing as a mid-life crisis. What this means is that mortgages are paid off by this age, offspring have (hopefully!) become independent adults, and (again hopefully)the middle-aged or older individual can finally afford to indulge him/herself a little. They’ve earned it! Me? In my late fifties, I bought an old Porsche 911. I bought it because I like interesting cars, and although I sold it later on the memories of that fabulous machine will always be there. The whine of that magnificent air-cooled engine as it spooled up for overtaking, and the wind in my hair on a summer’s day – go for whatever you fancy, Rereke! I’m thinking about one of these to go to the shops, instead of getting the car out. I skipped the Volvo phase. I like my 2003 Commodore V8 Executive. I’ve got plenty of information regarding increasing LS1 power Andy, be careful though it is a disease. Out my way which is not to distant from Deniliquin it’s not the when where or how of rainfall prediction that is a problem. It is the actual recording of exactly what does fall. “Our” auto gauge has history of failing at the most inopportune moments……when it rains. That in itself should not present to many obstacles for these “scientific geniuses” but like everything they do it seems to be at odds with the thinking of us not so “gifted”. One would think at the point of failure, which is recorded automatically, that what had fallen would be deducted from the “manual” gauge and the daily/ monthly figures could then be noted as an accurate observation. Simple? But alas as most who have had the misfortune of questioning “our BOM” nothing is simple. When queried by the local paper about another faliure in a particular heavy rainfall event by the auto gauge as to wether the manual gauges recordings would be used to make up the shortfall. The BOMs reply was perplexing to say the least. The manual gauges recordings after the faliure would not be used because and this is their words not mine…….”it would fudge the figures”!That would happen in EVERY “faliure” right around the country. Why the necessity of a back gauge, the manual one, if your not going to use it? I live approximately 5klms from the gauge and my readings over the year are pretty close to theirs. The discrepancy we’re talking about in this instance was well over 30mm. Not an insignificant amount considering we have had less than that 30mm for the whole of February this year. I’ve kept the paper clipping and read it again before writing this. Footnote: The reasons given for this failure were grass cuttings blocking the intake. It was blocked from late on a Friday till Monday morning. You are so right! The transition to the automatic weather stations for both recording of temperatures and rainfall is a real worry. 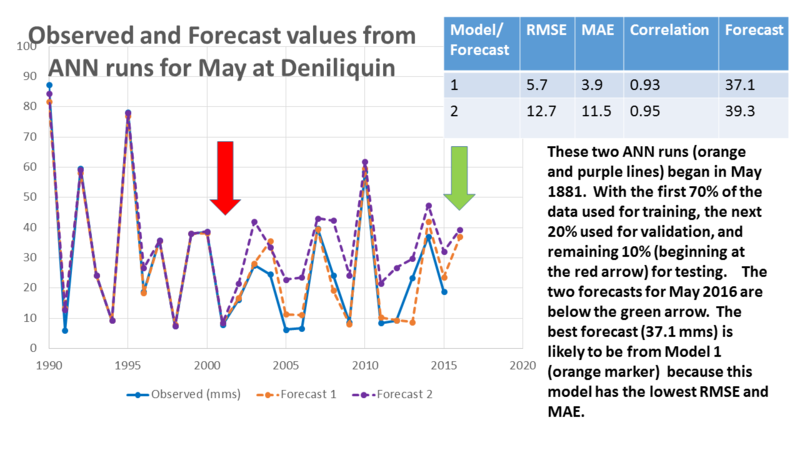 When I was putting the arrays together to do the forecasting for Deniliquin I compared observed rainfall at the Deniliquin original Wilkinson Street site (closed down end of 2014), with observed rainfall at the new Deniliquin airport site with an automatic gauge. The new airport site missed 2 or 3 of the real big events between about 2003 and 2014. I need to plot this data, and show it tonight/share with Jo. A fellow (another John) in Wangaratta has been reporting the under reporting of rainfall by the new rainfall gauge at the Wangaratta airport for some time, with the Bureau admitting problems, but suggesting that the new equipment is not as reliable as the old (and chokes on big rainfall events) is not a big deal. Of course, its a huge deal. But what to do! Jennifer, its a little more than perplexing when they run the Murray river inviromental flow out of Hume at near flood levels through winter. Then reduce the water allocations to the irrigators citing low rainfall for lack of water in the catchment dams. Between the BOM and the greens they’re “killing” us. Jen, I had a problem with an electronic wireless gauge. It was so bad that I gave up in favour of manual cylinder type. I found shortly after I installed it that the reading differed from the manual one. Problems were 1. the tipping bucket was wrongly calibrated (the actual size was about one third larger than shown in the instruction booklet (made in USA)so the reading was lower. 2. It could not correctly record low rainfall (ie upto 0.5mm) due to bucket inertia and evaporation. 3. It could not correctly record high rainfall (eg over 50mm/day) due missed counts, bucket overflow etc. 4. It was hopeless in heavy rain (over 30mm/hr)5. 5. there was at times wireless interference. and 6. there was a change as the gauge battery ran down. These problems could be overcome by a system which could cost a substantial amount. I would suggest the amount of collection needs to be large maybe 250mm diam. collection surface. The collected rain could be measured in a series of two buckets each on load cells so the second is a check on the first. The load cell readings should be recorded on an instrument USB as well as transmitted. Error messages need to be transmitted to alert maintenance as well regular check of USB information with transmitted information. Finally, rain gauges would likely be better sited away from an airport. I have been up in a glider and know that the weather pattern over the air strips is different from that of open country. Updrafts and cross winds are just two aspects. Measurements need to be made where the readings will be some use eg in dam catchments, or particular farms areas. Now, can we get an app for that so that we can get real information on the weather? 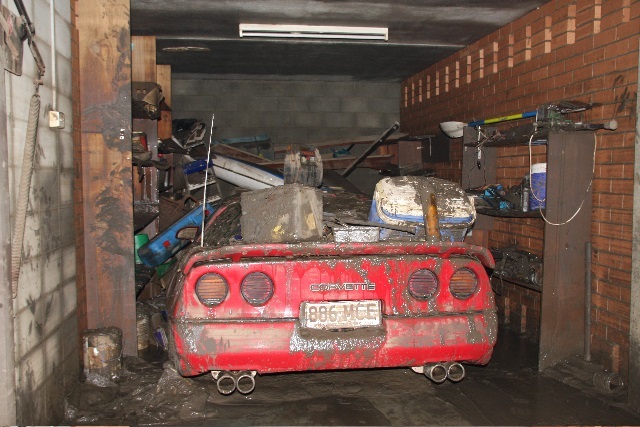 It was in a river-side garage in St Lucia, Brisbane, and totally submerged for 36 hours. He was heartbroken. The loss spurred us to see if we couldn’t apply the technique he had used to make the money to buy that car, to rainfall forecasting. I appreciate the nice segue but there were real heart-breaking stories during that flood. How much warning was there? As Tony points out, opening the sluice gates to full was a debate over three whole days. Were people told that it was a 50/50 possibility that the valley would flood at least to 1974 levels? Were people told how close they came to a complete collapse of the dam? I doubt it. Good work Jennifer and John. I will be very interested to see the predictive capability of this. After the years of people like Flannery saying we would never see drought busting rain again it would have been a brave politician who let water out of Wivenhoe after years where it approached less than 15%. This same BS brought us the useless “water grid”, the virtually mothballed desalination plant plus the theft of local government’s water infrastructure to give cushy jobs to political hacks like the former Brisbane Mayor now running “Unitywater”. Talk about waste of money ! We now pay more for water and sewerage, which as rate payers we built and used to own and had some democratic influence over thanks to electing local councillors than the rest of our rates combined. And the politicians who listened to this doom and gloom “End is Nigh” prognosticating retired or they were summarily thrown out. And 5 years later what do we hear from Federal politicians ? More “End is Nigh” nonsense backed up by the same clowns who made the absurd failed predictions in the first place! with what happens at Deniliquin. You should try the neural scheme at other locations, if you can get hold of the data, to see how well it reproduces the facts. It is one thing to be able to predict the weather but another matter entirely to predict how the loopy AGW-fanatic government will react to it. Will they fill the dam to overflowing and then release it at the height of the flood? Who knows what they will do next? Neural Net: a solution searching for a problem to solve. A neural net is supposed to work if the training data set is sufficiently correct, detailed, and long enough and the net to be trained is complex enough and suitable for the task. It has the advantage that it starts with the assumptions that the reality of interest is embedded in the training data set, that the net can correctly learn it, and that the problem it “solves” does not have to be understood. Unfortunately a neural net’s advantages are also its major disadvantages. The neural net learns something but the user of the neural net doesn’t. It adds next to nothing to the body of human knowledge. Ultimately, the answer becomes: “the computer said it so it must be so.” How is this significantly different from the so called climate simulations? I’m out of my depth, but keen to learn. Lionell complains that even if it works, the humans in the equation don’t learn anything and we simply go along saying, the computer says so. But we do that already. It’s a syndrome that’s been around for years. And there is no reason why we can’t build in ways to find out why the computer says so. Who is the boss, the machine or its user? If this works out it could be a valuable tool. And one way or another, we humans mustn’t stop thinking just because the computer says so. A tool is only as good as its user. Lionell. We are modelling, but unlike the Bureau we are not attempting to simulate the actual physical system. Rather ANNs search for relationships, then build the model. We control the type and quality of data inputted and how it is optimised, and of course ANN design. Our level of skill continues to increase because we are getting better in how we optimise, what we feedin, and how we design tha ANN. Example: A scientist measuring tree rings to predict temperatures through growth and yet missing the most vital part to tree growth…water or lack of…hmmm. I think they mentioned the study on ABC News Radio this morning around 0830 but they did not (of course) mention who was behind it, now I know why. Well done all, very interesting reading. I agree that being able to predict is better than not being able to. It might even have a significant practical value. That is as long as the future behaves much the same as the past that is embedded in the training data set. If there is an unlearned state change in the time series, the prediction breaks down and you don’t know if or why. Another weakness of the method is its ability to find relationships in the noise of the training data set as well as the causal relationships. There is no way to distinguish between them nor to predict their impact upon the results. There is this exact same problem with all linear and non linear multi-nomial curve fitting techniques. The inherent weakness is the increasing error bars as you extrapolate into the future or interpolation between training points that too far apart. The bottom line is that the output from such models are at best statistical suggestions rather than specifications of reality. They can not properly be taken as truth from the gods just because the computer said so. If you don’t understand the problem and if you don’t understand the tools you use to attempt to solve the problem it is very unlikely that you will solve the problem. Then if you do solve it, you won’t know that you have solved it. So what were 350 CSIRO scientists doing for those years and now moving on? Did they develop better rainfall models? Did they do anything at all except morning tea? Sell the CSIRO. Fund qualified scientists on real projects with real results or at least give them a tax break. My husband has been keeping data of the official day time temperatures for years (along with our water and power consumption). Now if I could only get him to add a column or two. I have been interested to see that the official forecasts a week out have been regularly higher than what transpired, but that is just an impression and I’ve never actually seen it documented. The impression I have is that after a period of MSM warmist forecasting the forecast temperatures are higher than those weeks when the MSM warmists back off a bit. Well done Jo for reporting this highly original and innovative work by Jennifer Marohasy and John Abbott. Congratulations to all. Someone out there in government must see the benefit of this work and arrange funding. Oh that is so sad to see. Our condolences John Abbott. It is, as my husband points out, an excellent opportunity to do a full restoration of it now. We brought both our corvettes with us when we moved back to Perth (me taking up permanent residency). One thing we have noticed is just how bad the weather forecasting truly is. Most often for the Armadale area they are off by at least a couple degrees. In my previous life as a geotech for a large multinational oil and gas company, we would have had our projects (and possibly our jobs) terminated if we had missed our target horizons by this much error. Wish you were going to speak in Perth, Jennifer! First point: decomposing a time series into sine waves is just Fourier analysis – nobody should ever write anything about it, since it is (almost) information-free and so easy to implement that you might as well write papers on taking logs of both sides. It’s almost as useless as Principal Components analysis (which is kinda like what a lot of Machine Learning boils down to). Second – more important – point: I have some misgivings about this application of NNs if the only input is rainfall. I would love to have a link to the paper (assuming there is one). If there was other data used – e.g., temperature (point or trend), distance from some other key point, etc – it would make more sense, but there’s no link to a paper that I could find. If the only input is rainfall, then it reduces to a roundabout way of getting parameters for an ARIMA model, and NNs are a bad estimation tool (because they preclude statistical tests of the parameters, and they tell you nothing about the underlying structural form). In other words, rain now depends on rain in the past – either linearly or non-linearly. (I can’t think of any reason why the relationship would be anything other than linear, but standard statistical tests for functional form are easy enough to apply to ‘traditional’ estimation techniques… even the good old Durbin Watson stat on the residuals will do). Using NNs to estimate ARIMA structures is a bad idea. One key shortcoming of Machine Learning generally, is that its implementations of things like gradient descent don’t furnish any measures of statistical precision for the parameter estimates – you simply don’t get parameter s.e.’s, and you can’t do F-tests or any other stuff like that. Statistical Learning (ML’s smarter-with-worse-marketing cousin) makes up for that to some extent, but is significantly harder – basically it’s moving to standard estimation with big data, and requires a highly trained practitioner. If it’s ARIMA in rainfall (or ARIMA augmented by GARCH/STARCH to adjust volatility), then NN seems the wrong tool. What I am basically saying, is that this current near-obsession with ML and DL (and NNs) is susceptible to the same critique as the ‘reduced form’ econometric models that used to be common prior to Lucas’ devastating 1976 critique of econometric modelling. The old way of doing econometrics was to chuck everything imaginable on the RHS, estimate it all by OLS, and pick and choose from the resulting parameters; cointegration, seasonality, collinearity and structural form be damned. Any dimwit could do it, and lots of dimwits did – resulting in commonly-held tropes (like Okun’s Law, the Laffer Effect and the Phillips Curve) that resulted from bad empirical work. After Lucas, econometric modelling moved towards structural form relationships with some equilibrium ‘attractor’ and a set of error-correction mechanisms to ensure model stability – with close attention to the orders of integration of the regressors. I have a strong bias whereby I think it’s obligatory that the application of statistical technique be done in the way that provides the greatest possible level of analysis of the output – not just a vector of parameters that apply to invisible underlying pseudo-features (my background is in computable general-equilibrium modelling and econometric modelling, and I am a stickler for technique being properly applied… which is why I view climate mdoelling as GIGO with a capital everything). When it comes to NNs (and Machine Learning, Deep Learning) I know a reasonable amount, both in theory (having aced the Stanford ‘Statistical Learning’ and ‘Machine Learning’ courses – the latter is the famous CS229) and in practice. In practice, I’ve built (or more properly, trained - using off-the-shelf libraries) several CNNs, the most elaborate of which combines year-on-year aerial imagery and administrative (cadastre and address) data to determine construction activity and changes in dwelling density for the whole of Victoria on a lot-by-lot basis. So you are the mongrel that lets local government spy on us to see if we have an illegal BBQ and gazebo construction in our backyard. Let’s put it to the test, here is BoMs three monthly outlook. There is no proper forecast at this link just some coloured maps with vague probabilities covering large geographic areas. We can provide actual numbers for specific locations. Yeah BoM is very vague and I agree we should get a follow up summary on their seasonal forecasts, its in all our interests to work out where they get it wrong. As much as I appreciate the work both of you are doing, coming up with an accurate seasonal forecast is the jewel in the crown. On this occasion BoM probably has it about right, but the winter season holds the promise of a real upset. Britain does have it’s own ‘Atlantis’. Daggerland was an area of land now lying beneath the southern Northern Sea, that connected Great Britain to mainland Europe during the last ice age. It gradually flooded by rising seas 6,500-6,200 BCE. The case is In re: Abengoa Bioenergy US Holding, LLC, 16-41161, U.S. Bankruptcy Court, Eastern District of Missouri (St. Louis). Abengoa SA (ABG.MC) put its U.S. bioenergy unit into Chapter 11 bankruptcy on Wednesday with up to $10 billion in liabilities, the latest twist in the multinational parent’s race to avoid becoming Spain’s largest corporate failure. The U.S. filing came as the Spanish company faced a March 28 deadline to agree on a wide-ranging restructuring plan with its banks and bondholders, without which it could be forced to declare bankruptcy. The filing by Abengoa Bioenergy US Holding LLC was prompted by involuntary bankruptcy petitions against two subsidiaries earlier this month by grain suppliers, including Gavilon Grain LLC, the Farmers Cooperative Association, The Andersons Inc and Central Valley Ag. The suppliers, which claim to be owed more than $4 million, said they were told that Abengoa Bioenergy, whose Spanish parent controls the “central treasury,” had run out of cash, court documents showed. I am also in the process of developing a mathematical model. It’s aim is to forecast Lotto numbers. The full Defence White paper released today goes a little further. “Climate change will be a major challenge for countries in Australia’s immediate region,” the paper concedes. “Within the South Pacific, variable economic growth, crime and social, governance and climate change challenges will all contribute to uneven progress and may lead to instability in some countries,” it states. The White Paper also acknowledges the threat that climate change poses to the ‘defence estate’ – Australia’s Navy bases will be impacted by rising seas and “more extreme weather events more frequently putting facilities at risk of damage”. Global warming is now entrenched in the white paper, Malcom is an intellectual featherweight. Anyway global cooling isn’t too far away so I imagine ‘climate change’ of a different variety should still pass muster. A late winter in Europe, AO has gone negative and forecast to stay there for at least a month. A luxury cruise with Tim Flannery? . . . could life get any more exciting than this? OK, it’s probably less risky than a luxury cruise with Chris Turney, but still. But I do wonder if the Climate Council are taking a skim of that $7,500 . . surely not. 18 passengers @ 7,500 = $135,000 – might pay for the crew, petrol, transport and a sling for Flannery. But check the fine print, if it is powered by renewables be prepared to row most of the distance. The headline alone is worth the price of admission. I wonder if Flanners will give UNSW some free tickets? That’s mid summer in Antarctica for you. Freezing Blizzards. Global Warming. GROUNDBREAKING new research suggests the global average temperature will remain relatively unchanged by the end of the century. The report – published in the Global Warming Policy Foundation – goes against the grain of more typical climate change predictions which anticipate a four degrees celsius rise. PHOTO CAPTION: Former New York City Mayor Michael Bloomberg attends a meeting during the World Climate Change Conference 2015 near Paris, France. Just 7 percent of registered voters say they’d definitely vote for him, while 29 percent say they’d consider it, according to a new Associated Press-GfK poll. Bloomberg has instructed aides to research previous third-party runs and is said to be willing to spend up to $1 billion of his own fortune, estimated to be about $37 billion, to finance his campaign and potentially blanket the airwaves with ads that could boost his numbers. Nice to have a lazy $1Bn lying around. Perhaps he could work a side deal with Clive Palmer and get a free nickel mine too? AUSTRALIA’s icebreaker vessel has suffered hull damage after being swept onto rocks during an Antarctic blizzard and is being assessed for seaworthiness. Sixty-eight expeditioners and crew continued to shelter on board the Aurora Australis on Thursday, more than 24 hours after it broke mooring lines in wind gusts of more than 170km/h. They are all safe and well and will be transferred to nearby Mawson Station when conditions ease, said Nick Gales, the head of the Australian Antarctic Division that charters the ship..
“Monitoring of the hull condition of the ship by the crew has revealed a breach in the hull into a space that is usually flooded with ballast water,” the Division said in a statement. Very interesting, starting which what you know really happens and looking for correspondences. This comes much closer to real science than thirty years of insisting CO2 is the only driver of temperature and temperature the only driver of climate. The first thing which has to be done is to fit the past. Good luck. Private research, privately funded is alive in Australia. The waste of money on the CSIRO Climate Unit was a public disgrace. How is the Hobart international conference on ocean acidification going? How can so many people be working full time without any objective or yardstick of success or even an identifiable problem? Did they achieve anything at all? Perhaps the serendipity machine has been perfected and the idea is to work on irrelevant things and hope something useful turns up, like the one WiFi patent? Considering everything which can happen has happened before, the other interesting possibility for weather prediction including rainfall is to take the now huge library of detailed weather patterns and compare them like fingerprints, looking though history quickly and using matches to predict what happens next based on accurate matches. The breakthrough with fingerprints about twenty years ago was to find just a few key points, which sped the search up billions of times enabling near instant matching instead of days to find just one match. A simple representative hash of the data might be enough. Then if the highest quality match was found prediction is not needed. You know exactly what happened next. This could even be used to check sequences for predictability, using historic data. In other words, pick a day last month using this and see if you are right the next day and how accurate it is. So this sort of technology, like the one proposed, could be applied to past before anyone bothered with the future. It is also true of the Global Warming models, but they were clearly never intended to be right because no one bothered to fit the past. They were just there to support man made Global Warming. Say you digitized fifty years of isobaric charts day by day plus temperature, so 18,000 day charts. Perhaps restrict to the same time of year. Pick a day. Find the closest day in pattern and tempereature distribution. Then compare the next day in both. See how similar they are in things like rainfall. This might be equally valuable to prediction from first principles. Michael Mann only deals in tan curves. The Clime Syndicate has an on-again, off-again, on-again relationship with The Hiatus. …a group of top scientists has just published a paper in Nature Climate Change robustly defending the idea that, as they put it, “The observed rate of global surface warming since the turn of this century has been considerably less than the average simulated rate” produced by climate change models. The authors include noted climate researchers Gerald Meehl of the National Center for Atmospheric Research, Benjamin Santer of Lawrence Livermore National Laboratory, and Michael Mann of Penn State University. Does this mean the Hiatus will be re-instated? … Lewandowsky said one reason matters are confusing is that there are multiple issues swirling here, and the main one he has taken issue with is the idea that global warming has stopped. A brief slowdown, if it existed, doesn’t show that. Because 16 years wasn’t enough to prove a hiatus but two years is enough to conclude the hiatus ended. Because starting a linear trend in the strong El Nino year of 1998 is just cherry picking but ending a trend in the strong el Nino of 2015 is just fine. Interesting tech bit about computer learning and practical application to geo locating images based only on the image itself. Offtopic – Somebody on Facebook messaged me that they are now a convert to skepticism after reading my posts on climate in my timeline. Another messaged me asking for reading material (suggestions welcome!). I also post at times to things one of my FB friends posts and invariably tangle with a few groupthink warmists – they can only ever manage to name call…. One funny one recently was a warmist claiming that increased CO2 makes plants use more water…. wasn’t he embarrassed when he posted a link to an article which told exactly the opposite. Then he claimed that it is causing desertification…. I easily found a couple of peer reviewed papers showing massive greening, including a nice one from the CSIRO on greening in arid areas….. This is puzzling… how did you point to more growth without conceding to the warmist that this must mean more water being bound up in plants (in the form, initially, of the H’s in carbohydrates) and being transported from soil to air due to increased transpiration? Aren’t photosynthesis, the water and carbon cycles, and evolutionary processes in general just wunderbar !! But increased CO2 percentage reduces the stomata opening frequency of C3 plants dramatically, and hence water loss. No puzzle involved. It is all easily explained. Maybe plants do take up a bit more water from the atmosphere. However that does not seem to be a problem. There is always some water vapour in the atmosphere. However the evidence points to more plant growth, even in arid areas, with increased CO2, it is the GAS OF LIFE! Not understanding this. What is the problem with plants which use more CO2 using more H2O? Plants are made wholly and solely from water and CO2 and sunlight. Carbohydrates are (H2O)m(CO2)n. You cannot grow anything more without using more water. However compared to CO2, we have infinite water, so what is the problem? Or is that there is less fresh drinking water left from growing food? If there is a shortage of anything it is CO2. We humans need food and H2O, so I guess there is a conflict somehow, but I cannot see it. The worst would be lettuce which is 96% water, so clearly salads are out if you want to drink your water. Are you addressing me or BS? Since I never stated a problem and since you are restating what I wrote, I am guessing BS. One comment though is the completely inaccurate statement that “we have infinite water” and this is not a pedantic comment regarding your loose use of a mathematical term. The whole planet has a lot of water but that doesn’t mean that every plant on the planet has access to it. Let me know when you tell a farmer in western NSW not to worry about their crops since “we have infinite water”, so I can warn accident and emergency of your imminent arrival. It was perhaps a bit general. As formation of tissue is formulaic, sure, you can only grow as much food as you have water. Grow less and you have water left over, but for what? Water is the major limiting factor. No water, no crops. As Dr Patrick Moore wrote, at 0.02% all plant growth stops and therefore all life on earth would end even with infinite water resources. Conversely what we are seeing in nature and in farming are record harvest levels and the greening of the planet, that .04% CO2 in the air is substantially more productive than .03% CO2, assuming you have enough water or can get it. In a general sense we have infinite water in that a farmer can often get/buy/make/drill more at a price but CO2 is fixed and therefore yields are limited. Consider that in a real hothouse, he can add CO2 and get more growth and this is often done. If you are now specific to a particular farmer, his water supply limits his ability to grow crops. However if he has access to more water but limited CO2, that also limits his crops and his yield. In all this man made Global Warming, no one much points out that apart from the now disproven hypothesis that more CO2 warms the planet, every other aspect of more CO2 is good and we do not have a problem. no doubt our MSM is all over the Abengoa story! lol. During his trip, Biden gushed that the stimulus was “the most ambitious energy bill in history.” Politico cites the $90 billion it “pumped into renewable power, advanced biofuels, electric vehicles and other green stuff” as helping to “triple U.S. wind capacity and increase U.S. solar capacity more than 20-fold.” Yet, probably because he obviously wanted to focus on the positives, Biden didn’t visit any of the “green stuff” projects. Everybody knows about Solyndra’s brief history, costing taxpayers over $500 million, but Abengoa has managed to use tricks and reported illegal practices to stay alive — until now. What is a Neural; network? Is this a Neural Network? Trying to communicate how hard it is to predict the weather a few months into the future, Niwa has turned to a mind blowing analogy to provide some idea of the complexity involved. “If you could imagine correctly predicting the outcome of every person on Earth tossing a coin 1000 times, you’d still be nowhere near the degree of complexity required to forecast seasons,” the crown research institute says in a recent article. comment #34 (Abengoa) in moderation. ICAP’s bullish outlook for the global carbon market echoes the recent annual Carbon Market Monitor report from the Point Carbon team of analysts at Thomson Reuters, which detailed how the global carbon market grew nine per cent last year to €48.4bn and is now tipped to grow by a quarter in 2016 as trading volumes and prices rise in the wake of the Paris Agreement. It may have taken longer than participants in the market hoped, but the prospects of a global carbon market capable of delivering cost-effective emission reductions have never looked stronger. ***This article is part of BusinessGreen’s Road to Paris hub, hosted in association with PwC. The ICAP Secretariat is grateful to the Dutch Emissions Authority (NEa) for funding this report. “The WTO Just Ruled Against India’s Booming Solar Program,” boomed the Sierra Club’s Ben Peachy in the Huffington Post. “WTO swats down India’s massive solar initiative,” grinched Grist, a story tweeted by the magisterial Naomi Klein with the comment ‘Business as F-ing usual’. “It’s important to understand what was at stake was not climate change,” says Ilaria Espa, a senior research fellow at the World Trade Institute in Bern. New Delhi proposes to do so in the next few days before the WTO ruling is adopted by the dispute settlement body (DSB). India had so far been arguing that since the power generated under JNNSM was bought by an agency of the public sector company NTPC, the transaction qualified as government procurement which was not covered by WTO rules. This was rejected by the WTO as the local content requirement was on power equipment and not power that is bought by the government. CHARLESTON, W.Va. (AP) – Amid doubts of global warming, West Virginia lawmakers look to delay new science educational standards. The amendment blocks Next Generation Content Standards and Objectives for Science now effective July 1. It would maintain current science standards until June 30, 2017. But Senator Snowball’s press statement on the agreement included shots at President Obama that seemed wildly out of place. “The media’s attention to Flint has put a spotlight on the crisis we face across the nation due to a failure to address aging water infrastructure. As a result of misplaced priorities of President Obama, who has consistently failed to partner with the states to address our nation’s real needs, stories are emerging in East Los Angeles, Baltimore, communities across Ohio, and elsewhere about lead pipes and other infrastructure problems that put the health of our citizens at risk. What we have here is an example of Inhofe helping strike a bipartisan deal, but taking a gratuitous shot at the White House and those who accept climate science, just for the sake of doing so. Amazing that Senate Republicans put him in charge of the committee that oversees environmental policy. Since I mentioned some OT stuff up thread it is only fair that I address Dr Marohasy’s fine work too. I have done a lot of multiple regression work. One of the biggest issues with this sort of analysis is omitted variable bias. This is where a variable that you may know nothing about causes the statistical behaviour you see in the data. That is a bummer for an experimentalist since it immediately falsifies all your hard work. The catastropharians suffer omitted variable bias the worst way. They leave out the variations of the Sun and the oceans in their analysis of global temperature, and since all these variables covaried in the 20thC they erroneously assigned the variance to the only remaining variable they have: CO2. Which brings me to Dr Marohasy’s approach. The advantage of a neural network model is it doesn’t need the variables to be prespecified. It just takes everything you put into it and evolves an output which matches the data. So, so long as you have put everything in the output uses everything. Thus omitted variable bias is avoided, even though you don’t get a statistical breakdown of the significance of each variable. Therefore Dr Marohasy’s approach is ‘way ahead of the climatistas since she includes all the variables. No wonder her model actually works. This article originally appeared on the blog for GLOBE Leadership Summit for Sustainable Business. Indeed, new C40 research (LINK) indicates that urban policy decisions made before 2020 could determine up to a third of the remaining safe global carbon budget that is not already locked-in by past decisions. Anderson, who is also a professor of energy and climate change at the University of Manchester, believes Figueres and world leaders decided it was necessary to “water down” the agreement – stopping short of what is really required to avoid dangerous consequences for the planet. Neither Anderson nor Schneider thought that Figueres had been pressured not to seek another term. Coming hot on the heels of COP21, Abu Dhabi Sustainability Week dissected the agreements made in Paris and pinpointed the growth areas for renewable energy. Kelvin Ross spent a week in the emirate to hear the debates and talk to key clean energy players. “COP21 recreated global momentum in climate change that we had not seen for a decade,” said Adnan Amin, director-general of the International Renewable Energy Agency. Speaking at a FT (Financial Times) Question Time debate on the first day of the sustainability week, Christiana Figueres, executive secretary of the UN Framework Convention on Climate Change, said that Paris was a “multi-decade agreement” and would mean “doing an honest report card every five years”. Joining Figueres on the panel was Kyung-Ah Park, head of Goldman Sachs’ Environmental Markets Group, who said that COP21 is “an incredible milestone” but warned that “capital does not move on political will”. ***At the forefront of ADSW is Masdar, the Abu Dhabi-headquartered group which has, in a relatively short time, become a major player in the sustainable energy arena. India was repeatedly hailed as the world’s hot spot for future renewable development. “The potential of India is huge – the number of gigawatts is mind-boggling,” said Amit De, senior strategist at Canada-headquartered solar developer SkyPower Global. – the number of gigawatts is mind-boggling ….. SkyPower has committed to build 18 GW of solar projects in India by 20022 …..
A truly rooly mind boggling, mind blowing, humungously monumentally mammoth 18GW of Solar Power Plants. Excuse me for laughing so loudly! If they cover the Earth with their solar plants they will still get nothing at night. Does no one understand the importance of that little problem? After dark there is some of the largest power demand as lots and lots of high powered lights come on and people go out to play among other things. And they will supply it with conventional generation or they won’t supply it. And yes, I know lighting is one of the least power consumers compared to other things. But with the way we light up our cities and their buildings at night these days, it adds up quickly. And many of those other power consumers will continue on after dark. I can just imagine the sign next to the buttons for a solar powered elevator in some modern highrise building. Warning, in case of darkness use stairways for exit. Being a realistic engineer the only way wind or solar power can make a difference is in stored energy for use when needed. Potential energy is handy, use them to pump water. It matters not if it is sea water or fresh, just get it up hill, better than a battery , more reliable and pollution free. Do these people not think the big picture. Drs Abbot and Marohasy may also be interested in artistic uses of neural nets, such as blending the outline information from one picture with the textures learned from a different picture. Sometimes the output combinations look confused, sometimes they look quite groovy, all depends on the input pair and 4 user-adjustable parameters. Learning regional-scale climate patterns and using them to infill larger scale climate simulations is left as a reader exercise. Kevin Long (The Long View) has predicted the next four winters will be dry in the MDB. Saw it on WIN News.